The Festival is entirely dedicated to music created for the needs of motion pictures. The unique combination of the highest quality of interpretation of film music performed by leading musicians and orchestras, in combination with high quality of film picture, decides on the uniqueness of the event. The programme of the venture puts its stakes on genre diversity: from reviews of retrospect and exclusive ceremonial concerts in performance, through monographic concerts of chosen and distinguished composers of film music, and finally at mass shows in the open. Monumental musical and film shows are distinguished by boldness in production and innovativeness in the sphere of sound and picture technology, but also by performance swing, artistic standard of works presented, as well as due to the presence of the most outstanding creators and composers. These events do not have their equals in Europe. Because the Festival of Film Music arouses great interest in the film environment (it takes place right after the Film Festival in Cannes and a week before the Krakow Film Festival) and attracts modern elites of the world of music, culture and film to the capital of Lesser Poland, as well as lovers of cinema and film arts – a significant aim is treating the event as an event of huge format contributing to supporting activities connected with the Regional Film Fund, with the promotion of the local infrastructure and music groups on the international cinematography market. Thanks to the festival’s breadth, international promotion, and above all the presence of fantastic guests from the film industry, cooperation with the film and production environments, the festival is becoming a recognisable label in Europe, the United States and in Canada. The Festival of Film Music was twice nominated for the Media Award Niptel 2008 for its innovativeness. The Academy valued the organisers for the courage of creating an event of international reach and standard, as well as presenting music created to picture in an interesting and able way, arousing interest, curiosity and delight of the festival’s multi-generation public. 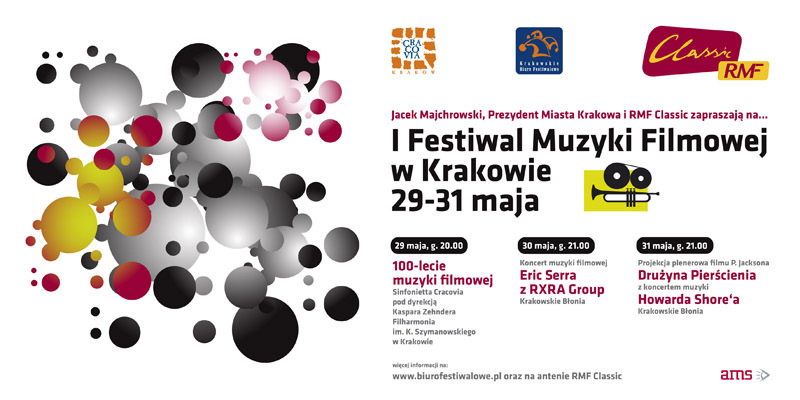 The portal Muzykafilmowa.pl, focusing fans, reporters and critics of film music, for the fourth time in a row announced the festival as “the Event of the Year”.